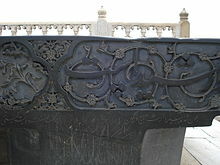 Persian (/ˈpɜːrʒən, -ʃən/), also known by its endonym Farsi (فارسی fārsi [fɒːɾˈsiː] ( listen)), is one of the Western Iranian languages within the Indo-Iranian branch of the Indo-European language family. It is a pluricentric language primarily spoken in Iran, Afghanistan (officially known as Dari since 1958), and Tajikistan (officially known as Tajiki since the Soviet era), Uzbekistan and some other regions which historically were Persianate societies and considered part of Greater Iran. 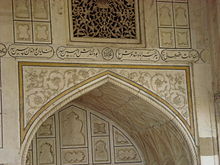 It is written right to left in the Persian alphabet, a modified variant of the Arabic script. ^ a b c Samadi, Habibeh; Nick Perkins (2012). Martin Ball; David Crystal; Paul Fletcher, eds. Assessing Grammar: The Languages of Lars. Multilingual Matters. p. 169. ISBN 978-1-84769-637-3. ^ "Persian | Department of Asian Studies". Retrieved 2019-01-02. 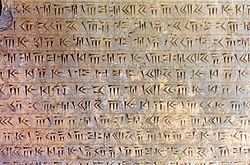 There are numerous reasons to study Persian: for one thing, Persian is an important language of the Middle East and Central Asia, spoken by approximately 70 million native speakers and roughly 110 million people worldwide. ^ "Persian or Farsi?". parents.berkeley.edu. Archived from the original on 2017-01-04. Retrieved 2016-02-27. ^ a b Spooner, Brian (1994). 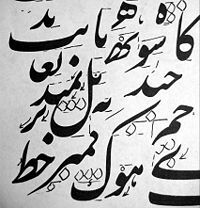 "Dari, Farsi, and Tojiki". In Marashi, Mehdi. Persian Studies in North America: Studies in Honor of Mohammad Ali Jazayery. Leiden: Brill. pp. 177–178. ^ a b Spooner, Brian (2012). 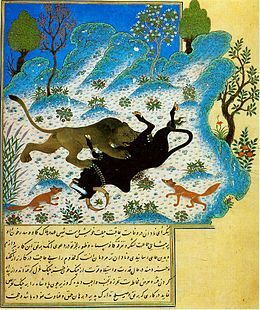 "Dari, Farsi, and Tojiki". In Schiffman, Harold. Language policy and language conflict in Afghanistan and its neighbors: the changing politics of language choice. Leiden: Brill. p. 94. Jones, Sir William (1823). Samuel Lee, ed. A grammar of the Persian language (8 ed.). Printed by W. Nicol, for Parbury, Allen, and co. p. 230. Retrieved 6 July 2011. Jones, Sir William (1828). Samuel Lee, ed. A grammar of the Persian language (9 ed.). Printed by W. Nicol, for Parbury, Allen, and Co. p. 283. Retrieved 6 July 2011. Palmer, Edward Henry (1883). Guy Le Strange, ed. A concise dictionary, English-Persian; together with a simplified grammar of the Persian language. Completed and ed. by G. Le Strange. Retrieved 6 July 2011. Palmer, Edward Henry (1883). Guy Le Strange, ed. A concise dictionary, English-Persian: together with a simplified grammar of the Persian language. Trübner. p. 42. Retrieved 6 July 2011. Richardson, John (1810). Sir Charles Wilkins; David Hopkins, eds. A vocabulary, Persian, Arabic, and English: abridged from the quarto edition of Richardson's dictionary. Printed for F. and C. Rivingson. p. 643. Retrieved 6 July 2011. Sen, Ramdhun (1841). Madhub Chunder Sen, ed. A dictionary in Persian and English, with pronunciation (ed. by M.C. Sen) (2 ed.). Retrieved 6 July 2011.